UPDATE : Some readers are having difficulty with Scribd. I do not know why they are seeing subscriptions when these tutorials are free. If you are one of these, please check out my Slideshare account which has the downloadable pdfs there too. 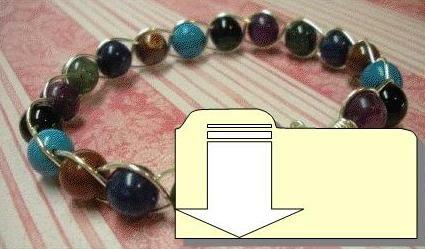 Judy Larson and I are working together to publicly share her free jewelry making project pdfs. However, due to the limitations of Blogger, I cannot attach pdfs to blog posts. Instead, I embed them using Scribd, the free document sharing site. Some readers are understandably unfamiliar with Scribd so here are some instructions on how to download the pdfs via your computer or mobile device. The picture below shows what an embedded pdf looks like on my blog. The red circles indicate the two places you can click to download the pdf. The easiest and best way is to use the bottom one as it opens the pdf for you to save it directly to your computer. As far as I can see doing it this way does not require you joining Scribd at all! If you are a subscriber (email or RSS) you won't see the image - just the first link above. So if you still don't want to join Scribd then you must click on the post title to return to the blog so you can click on the second link. 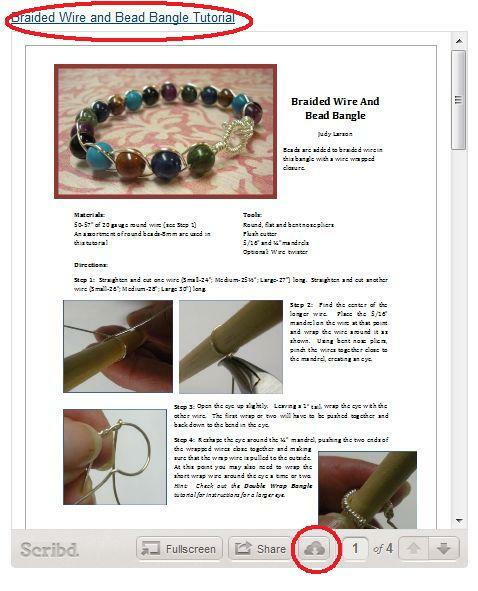 If you click on the first link, Braided Wire and Bead Bangle Tutorial for example, you will be taken to the Scribd page (below) where you can download the pdf. However, you must log-in to do so. You can either use a Scribd account (free to join) or your Facebook account if you don't wish to remember yet another password. If your Facebook account doesn't work, I suggest you try joining Scribd and see if works better. If you encounter any problems or glitches, try waiting before attempting again. This is because the site is popular and can be overloaded with users. You can also search for other free pdfs. Many of you are now reading my blog on your smartphones and tablets. Go to the tutorial post and click on the link above where the image should be. This takes you to a mobile view of the Scribd page for that tutorial. Click Download Now. On the next page as it was loading up, I selected Open in iBooks at the top. I then went to my iBooks app, selected the pdf category (not books) and there it is on the "shelf"! The other pdf in my iPhone library is my camera instructions! You can also email yourself the pdf from iBooks to yourself so you can store it on your main computer. However, the advantage with a mobile device is the ability to have the instructions right on your work table or wherever you make jewelry! As I don't own an Android phone, I can't say how downloading the pdf will be like for that type of smartphone. If you do have an Android phone, try clicking on the link and see what happens when you attempt to download the pdf. Where does it go? And can you save it somewhere. And what reader did you find best to read it? One reader who uses an Android phone says there is a Scribd app in the Market but it wasn't rated well. Update : Download the Adobe Reader from Google Play. Update : Here is an excellent tutorial on how to download for Kindle owners. Please share your comments about Scribd and let me know if this helps. Super info Pearl. Thanks so much. I plan to give it a try on my Kindle Fire when I get home tonight. I'll let you know how it does. Wonderful, if it works! Go for it! The Kindle Fire does display pdfs but I am not sure how it works for downloading. Thanks for working so hard to help us all figure out new things on our many forms of communicating/surfing! In my case, when I got to Scrbd via the link it was full size but at the top it asked if you wanted to use the mobile app. It showed this before but no matter how many times I clicked it, I got no movement. I finally long-held for the menu and chose OPEN and it worked! When I 1st got to their site, I noted in the login area that my name was listed as my FB page and I did not have to write a password or anything else. I don't know if the OPEN issue was my phone, a scrbd issue, or MY issue. When it switched to the mobile app, it asked if I wanted to dload the app or did I want to skip that and go on to dload. I chose the 2nd and was taken directly to the dload page. Well done! You got there in the end and proved to readers with Android phones that you can download the pdfs! Now you can take your phone to your work table and follow Judy's instructions!